Casualties were reported on both sides as gunfire broke out in Slavyansk in eastern Ukraine, where anti-government protesters seized several buildings. The city is under siege as Kiev announced an “anti-terrorist operation” against the protesters. The shooting apparently erupted Sunday morning at a checkpoint, which was established by protesters Saturday evening on the outskirts of the city. Amid the skirmishes, Ukrainian helicopters were flying overhead. Local residents also said several transport helicopters landed at an old airfield some 5 kilometers from the town center. Troops wearing black uniforms disembarked and went toward Slavyansk. In the skirmishes, one of the troops from Kiev was killed and five others were injured, coup-appointed Interior Minister Arsen Avakov reported on his Facebook page, which he regularly uses to report on his ministry’s activities. The officer killed was a member of the Ukrainian Security Service (SBU), he said, adding that among those injured is the commander of the SBU’s Anti-Terrorist Center. 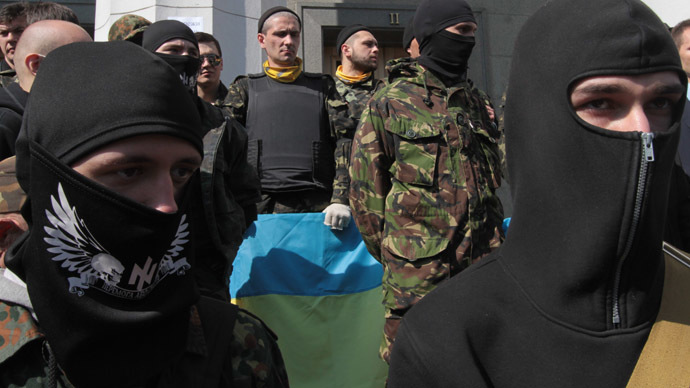 Avakov said that the protesters had also sustained casualties, but gave no further details. He accused them of using civilians as human shields. Reporters in Slavyansk said that some locals were present at the protester-held buildings and barricades, but said they were volunteers supporting the pro-independence cause. The Donetsk region health authorities said one person has been killed on a road connecting Slavyansk with Artyomovsk, and another five injured by gunshots in the city of Slavyansk. It was not immediately clear whether these casualties were the ones referred to earlier Sunday by Avakov. 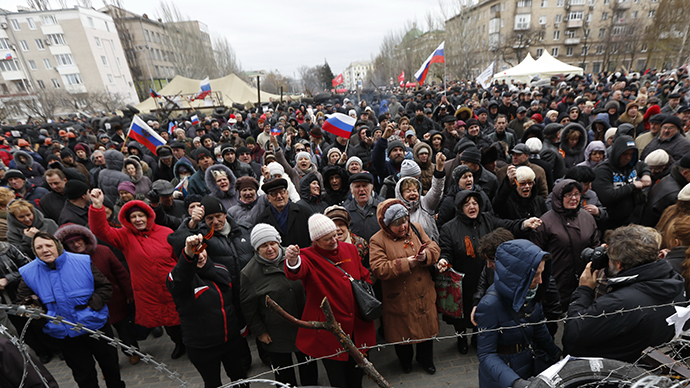 The protesters in Slavyansk said one person was killed and two others injured on their side. 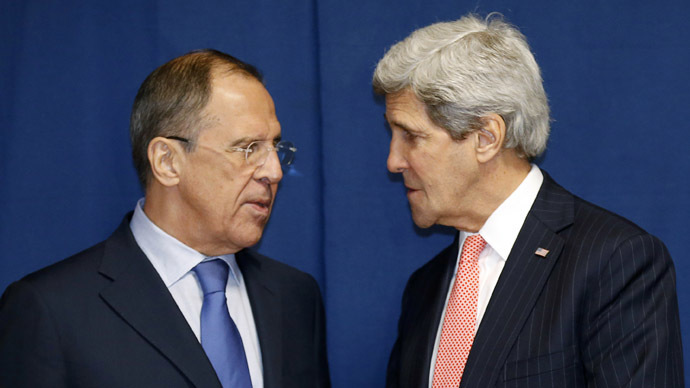 They also claimed that two of the Kiev troops were killed. A local man has told RT that the Right Sector members, as he assumes, were shooting at him and other people as they were heading to Slavyansk to deliver humanitarian aid. 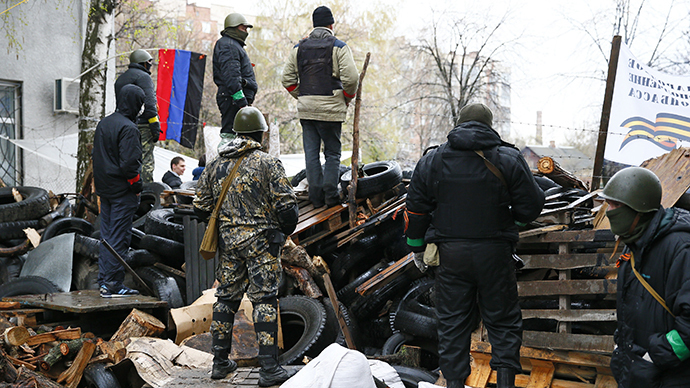 At least one of the protesters’ checkpoints was taken down and demolished by troops from Kiev. However, the defenders fell back and erected a new barricade at a bridge, RIA Novosti reports. The defenders of the city set on fire some of the barricades, which were made from tires. Approaches to the city have been blocked by uniformed troops besieging the city, RIA Novosti reported. Local bus services from the city have been canceled due to the blockade, Itar-Tass reported. Kiev’s troops are still not in control of the town center. The protesters at the Slavyansk police station, which was the first building they captured Saturday, are preparing to fend off a siege, LifeNews reports from the scene. The building has been reinforced with barricades over the past 24 hours. Similar defensive precautions are being taken at other buildings controlled by the protesters. Avakov on Sunday morning has announced an “anti-terrorist operation” in Slavyansk. As the confrontation was under way, the official said that civilians in the city should remain indoors and away from windows. Avakov already announced “zero-tolerance policy towards armed terrorists” in Slavyansk and the deployment of anti-terrorist troops in the city on Saturday morning. However no action materialized, as security troops reportedly refused to follow an order to attack protesters.